The new Palm Pre has been getting some big love from the media since its launch at the CES show, with some good early coverage online already. I thought I’d have a little sniff around too, to see whether it’s really as ground-breaking as everyone is saying, and I did discover something interesting. The thing that’s wowed most people about the handset is the interface, with things like multiple live windows running on screen for each program running in the background. It occurred to me that this was pretty powerful stuff for a handset to be doing. Let’s face it, the iPhone can’t even manage to run multiple programs, let alone display live widgets on screen. So I asked the chip maker, TI, to tell me what was so special about the processor. The answer is very revealing, not just for the Palm Pre, but as a pointer to the future of the mobile phone market in general. The chip in the Pre supports up to a 12 megapixel camera (!) as well as offering support for 720p HD video. It looks as though we are on the verge of moving into a new level in handset design, with what TI call ‘laptop type processing’ as standard. That means no more laggy web browsers, and an end to dodgy page scrolling as the processor and memory struggle to keep up with our PC driven expectations. 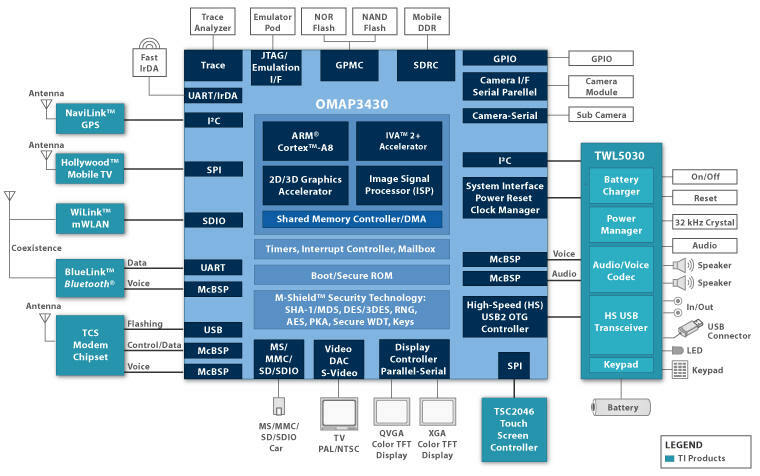 The processor in the Palm Pre is the OMAP3430, watch out for it in other products and further developments in the low power super small CPU market. I never thought I would say this: I actually want something that Palm sells. I suppose it's a bit early to understand what this might mean to battery life on the Pre?